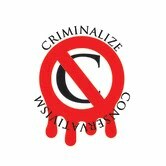 Criminalize Conservatism: Conservative Love To Hate! In Jonathan Bernstein at Salon.com's story yesterday, "Will the GOP ever get serious?" The Republicans' big-idea guys and policy wonks outlined their 2016 platforms this week. They sound a lot like 1980," it looks indeed like "...Republican politicians these days don’t even remember what actual policy ideas look like." "We just managed to get through a campaign in which the Republican candidate’s idea of innovation was to hold a convention themed around an out-of-context quote from his opponent. But we knew Mitt Romney was at his heart a manager, not a policy innovator. So maybe it will be better next time, with new candidates such as Bobby Jindal, Marco Rubio and Paul Ryan. Right? "Yeah, I didn’t think so. "Start with Jindal. An alleged policy guy, he published an almost embarrassingly empty op-ed this week that had all of two ideas: a Balanced Budget Amendment and term limits. In other words, the same old ideas that Republicans have been trotting out since …well, certainly since the Reagan administration. Okay, granted, Jindal’s version of the BBA is the souped-up one that Republicans have been pushing recently, but that’s even worse than the old-fashioned variety – it seems to track what Bruce Bartlett called 'the dopiest Constitutional amendment of all time' when Tea Partying members of the House were pushing it in early 2011. "Marco Rubio? His big rollout speech was given while accepting a Jack Kemp Foundation award. His big idea, as Dave Weigel reported this week, turns out to be the exact same policy ideas that Republicans have been giving for some time now but labeling each one as a benefit for the 'middle class.' Which mainly involves reciting the words 'middle class.' A lot. A whole lot. As Weigel counted, 35 times. "Not much in the way of new ideas there, either. "Now, it’s true that Paul Ryan cannot be fairly accused of simply echoing back the same stale policies Republicans have been running on for three decades. Unfortunately, what he has replaced them with is a shell game; as Paul Krugman has long pointed out, Ryan – the Eddie Haskell of the GOP – is more con man than policy wonk. "What’s happened? I think a large part of it is that there’s very little incentive from conservative audiences or conservative voters for policy; what gets them excited (and reaching for their wallets, in many cases) is partisan rhetoric, not policy. For the last several years, the way to get a big reaction in conservative circles is to make a teleprompter or a birther joke, not to bring up unsolved problems in the nation. Just as Swift boats and flip-flop jokes were all the rage before that, and Whitewater, Travelgate and the rest of the nonsense they threw at Bill Clinton was popular in the 1990s. "Better that, apparently, than addressing what needs to be done about jobs, health care (we’ve been waiting two years now for a 'replace' portion of repeal-and-replace), the climate, income inequality or any of the other things that ordinary Americans identify as things that should be fixed. "In other words, there’s just no sense at all that Republicans have become a party capable of identifying real problems in the nation and finding solutions – conservative, pragmatic or anything at all – to them. They’re just the same old group that is easily mocked for suggesting that tax cuts for the rich will be a cure-all and that has to remind itself not to insult half the electorate. Of course, there’s a long way to go before the 2014 midterms, let alone the 2016 election. 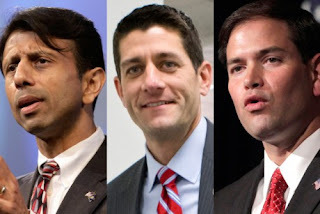 But judging from what Jindal, Rubio and Ryan had to say this week, they’re going to need all that time." 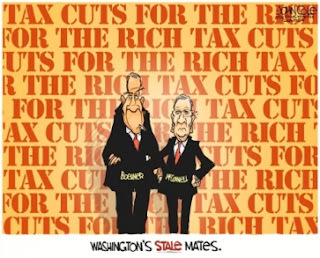 What most of us don't realize is that the GOP has no intention of being anything other than the same old Conservative front group for those who want yearn for an American Age of Feudalism. It bears repeating: "They're just the same old group that is easily mocked for suggesting that tax cuts for the rich will be a cure-all and that has to remind itself not to insult half the nation." As we have been preaching since the beginning, the Republican Party is the Conservative leaderships' legitimized spokesman, wanting nothing but protection for the income and assets of the greediest among us; every other issue is nothing but smoke to attract the uninformed, ignorant, and hateful among us, whether "States' Rights," "balanced budgets," "freedom," blah, blah, blah. The Conservatives feel themselves above the law and are committed to overturning our Constitution no matter what law or moral precept stands in their way. The only thing separating 2012 from any other election year besides 1800 is that the Conservatives and their candidates publicly insulted "half its audience," believing with all their hearts that they were going to win and therefore that they could come clean and tell the voters the truth about their underlying beliefs and attitudes towards the 98%. If the Mafia had tried to make anonymous contributions for their political puppets, the Justice Department would have been on them immediately. 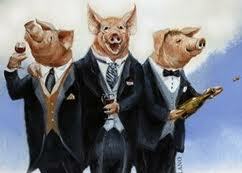 With the corrupt wing of the Supreme Court in charge, the richest Conservatives among us fear no retribution at all. Criminal behavior is criminal behavior, no matter who commits a crime - as the GOP loved to tell us when they were trying to convince the country that President Clinton had committed a crime in the Oval Office. It's time to take away the veil from our eyes and admit the obvious truth: Conservatism is a crime and must be eradicated before it's too late.